Description: The iPad is a popular device for digital writing. In fact, there are dozens of apps that are dedicated to the task. Some of my favorite writing applications include Notability and Explain Everything because they allow you to record audio and video notes; and Keynote and PowerPoint allow you to annotate during presentations. However, the iPad does have a major flaw with regards to digital annotation. Accurate stylus options are typically overpriced, while the inexpensive options suffer from poor writing precision. That being said, many Apps for iPad contain features that aim to make handwriting easier and more accurate. For example, page zooming and zoom boxes are a couple of feature within an App that help improve handwriting. But the biggest drawback of writing on an iPad is still training yourself not to rest your palm on the screen while annotating since it results in stray marks and unintentional button pressing. Description: This Android tablet is notable due to its integrated stylus. The “S Pen” that comes with this tablet allows for a greater degree of precision while writing. You can even rest you hand on the device’s screen while annotating with the S Pen! Yet the drawback to this tablet is the limited number and capabilities of good annotating Apps. Fortunately, the Galaxy Note 10.1 comes pre-loaded with an annotation App from Samsung, since other options in the Google Play Store are hit or miss. For instance, the Explain Everything Android App has fewer features than the iPad version. But in due time, annotation App availability and capability will not be an issue. Description: This Windows tablet is not only a powerful computer but is also a great tablet. Paired with great performance and a precise stylus, you can use this device to run desktop applications with the benefits of digital writing. You can install Explain Everything on this device (through the Microsoft Store) in addition to Adobe softwares, PowerPoint, and Smartboard softwares. So, not only would this be a great device for taking notes and annotating presentations, but you could also use it to record, edit, and publish high-end instructional videos. For example, you could install Open Sankoré to record annotated screencasts and then edit and publish the footage with any video editor made for Windows. 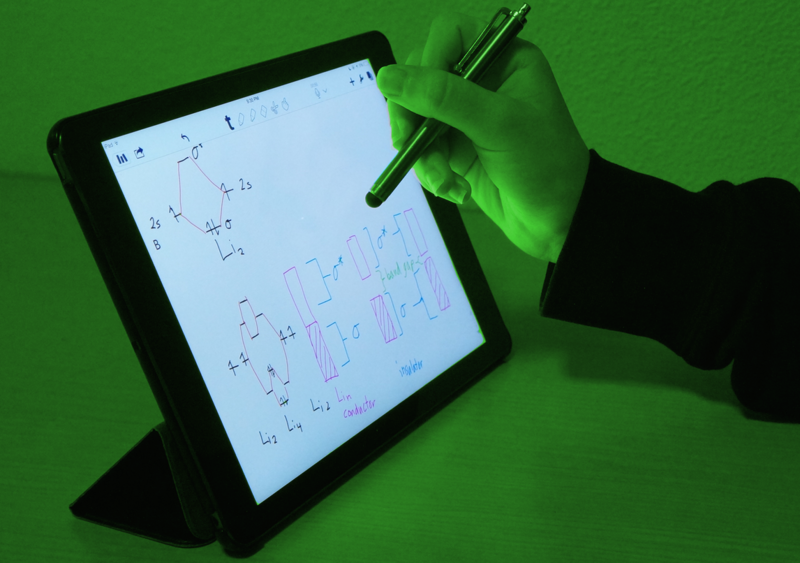 Since this device is both a computer and tablet, this particular tool could serve as a singular device that accomplishes both traditional computer and tablet computer tasks. Description: If money is not a factor, this is my favorite tool to create instructional videos with. Since the Modbook Pro is essentially a Wacom tablet grafted to the top of a MacBook Pro, you are looking at a price tag nearing three thousand dollars for a Modbook Pro. But, with the ability to install both Mac and Windows operating systems on a Modbook Pro, you can run any desktop application on this device while utilizing the added functionality of an accurate Wacom digitizer. Just like with the Surface Pro 3, I would suggest using Open Sankoré for making instructional videos. But you can also use the annotation tools in PowerPoint and Keynote among many other softwares. Analogous to the Surface Pro 3, this device is also great for traditional computer and tablet computer tasks. Although the Modbook Pro is more versatile keep in mind that it is bulkier and more expensive than any other digital writing tool listed. Description: If you already own a powerful computer, you may consider adding this accessory to your machine. There are many models of Wacom tablets, including ones with built in displays. Like the Surface Pro 3 and Modbook Pro, the benefit of a Wacom is that you can utilize the desktop software already own on your computer with the added benefit of digital writing. You can also use Wacom devices for instructional video production with Open Sankoré to produce screencasts. The downside to this peripheral is that it is impractical to use for presenting or moving to a separate location frequently because you would have to transport both the computer and the Wacom tablet back and forth to class or conferences. However, for digital writing in a non-mobile environment, this is a fantastic option. These are just a few of the digital writing tools available nowadays. Whether you would like to use digital writing devices for note-taking, annotating presentations, video production, or any other use, I hope this information will be a helpful starting point.